The ASUS Zenfone 5 is one of the three Zonefone devices that were announced at CES earlier this year. 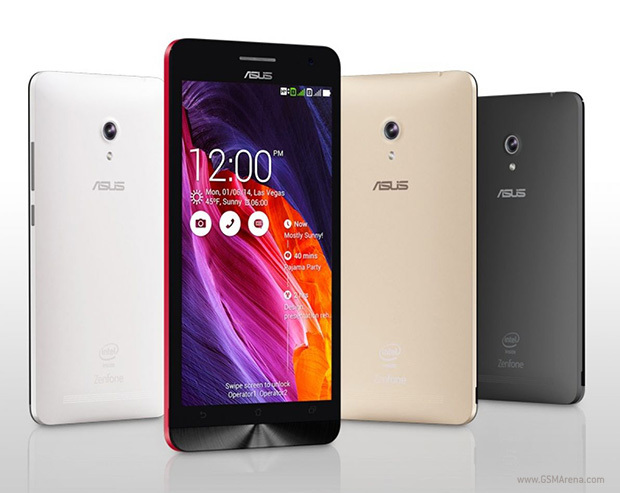 Based on Intel’s x86 Atom processors, the Zenfones run ASUS’ new ZenUI on top of Android. The Zenfone 5 is the middle one of the three devices and comes with a 5.0-inch 720p display, dual-core Intel Atom Z2560, 2GB RAM and 8 megapixel camera. Let’s see how well it performs. One of the good things about the Zenfone 5 is the design. The phone has a simple yet elegant look to it, with an attractive spun metal finish below the display and a clean matte plastic back. There are some unsightly bezels on the side of the display but the overall design is attractive. Despite being made entirely out of plastic, the build quality of the phone is solid. The back cover snaps on with a reassuring feel and there is no play or flex in the body. The overall weight of the device is perfectly manageable and despite the 5.0-inch display and sizable bezels the phone offers a comfortable grip for one handed use. Going around the design we see the earpiece, notification LED and the front camera on top. The notification LED is rather tiny and it’s actually quite easy to miss even when its glowing. Below the display are the three controls – Back, Home and Multitasking menu – something you’d expect to find on the display itself but ASUS has chosen to place them on the phone itself, thus freeing some space on the screen. The decision to move the controls out of the display doesn’t bring any real issues, although there is some delay between pressing and holding the Home button before you could swipe up to access Google Now. In other phones you can swipe up instantly. The problem comes with the keys themselves. The back and multitasking buttons are spaced too far apart from the Home key and are a bit harder to access. Secondly, there is no backlight for the keys, which is a monumental blunder on ASUS’ part and makes accessing the keys in the dark frustratingly difficult as you have to hunt them around with your finger before you could hit them. On the top of the phone is the headphone jack and the secondary microphone, on the right is the power button and the volume control keys with the familiar spun metal finish and on the bottom is the microUSB port and the primary microphone. On the back, ASUS has kept it simple with the 8 megapixel lens of the camera at the top with a single LED flash below and near the bottom is the loudspeaker grille. The grille is on the tapering edge so it does not get blocked when you keep the phone on a surface and in fact helps the sound reflect towards you. It does get blocked, however, when you hold the phone in landscape mode to watch a video or play a game. And the speaker is not particularly loud to begin with. The back cover can be removed with a bit of struggle from the side. Once inside, you will find the two SIM card slots and the microSD card slot. The battery is non-removable. The Zenfone 5 has a 5.0-inch, 1280×720 IPS panel. The display is pretty large but tends to look smaller than it is due to the considerable bezels on the side. In terms of quality, the display has natural looking colors, sufficient sharpness and ample brightness indoors. Outdoors, however, the visibility isn’t particularly good and it tends to wash out considerably. ASUS provides a display calibration app on the phone that lets you adjust the color, contrast and white balance of the display. It’s a lot more elaborate than the simple presets that we find on some other smartphones although I found it best left at the default settings. The Zenfone 5 runs on an Intel Atom Z2560 “Clover Trail+” x86 SoC with a dual-core CPU clocked at 1.6GHz and Hyper-Threading support (which means the OS sees it as quad-core CPU) and PowerVR SGX544MP2 GPU clocked at 400MHz. There is also 2GB of RAM, 8GB storage space and a microSD card slot. On the software side, the phone runs ASUS’ ZenUI on top of Android 4.3 Jelly Bean, with KitKat said to arrive soon. As far as custom skins go, this is one of the best I’ve seen on any Android device to date. Visually, it is very attractive, with a minimal and flat design for all the apps. The apps utilize soft pastel shades and the color of the action bar extends all the way to the top of the screen as we previously saw on HTC Sense 6 and before that on iOS 7. The good thing about the skin is that there is a good balance between design and functionality. ASUS has not chosen to load every conceivable feature into the phone and nor has it kept things too simple. I found there was a good deal of useful features on the phone, stuff that I’d actually use without anything unnecessary. In terms of performance, the hardware and the software work remarkably well together. On paper,the Intel processor does not sound like much and even in benchmarks it does rather poorly. But in practice the phone flies through all the apps with relative ease, without any slowdowns or stuttering. Even the multitasking is great, thanks to the ample 2GB RAM. Performance in gaming is slightly less impressive, with the GPU having just enough power for the 720p display. Most of the games do work fine, though, but you will notice the occasional stutter here and there, which is not that big a deal. Being an x86 system, I initially had concerns regarding whether apps will work correctly or not. Barring a few exceptions (Snapchat and Facebook apps would crash on launch) all the other apps I tried worked perfectly. What does harm the app experience is the paltry 8GB internal memory, of which only 5GB is available to the user. Thankfully, ASUS provides the option to install apps on the memory card, but this eventually depends on the app itself and some apps will only install on the internal memory with no way to move them. I also realized apps like SwiftKey have to be installed on the internal memory otherwise the keyboard is disabled after a reboot and you have to manually enable it every time. Moreover, it remains to be see if the option to install on memory card remains after the KitKat update. The Zenfone 5 is dual-SIM, dual-active. Moreover, both the SIM slots support 3G, unlike most other phones. However, only one SIM can use 3G at any point of time. You can choose from the phone’s settings which SIM you want for calls and which one for data. The SIM you choose for data gets 3G and the other SIM is relegated to 2G. This saves you the time to switch the SIM cards around manually. The problem with this, however, is that it takes far too long to switch data from one SIM to another through the software. In that period, the data and the network is disabled on both the SIMs. You have to wait around two minutes or so for the switching to complete. I had major issues with the GPS on the Zenfone 5. This is by far the worst GPS experience I’ve had on any device and I’m not sure if this was a fault with the handset I received or the phone in general. The phone would often lose the GPS signal while on the street. After that it would absolutely refuse to get the signal lock until you exit the Maps app and tried again, after which it will hold on for some time before losing the lock again. If you’re on the street in moving a cab and looking for quick directions and the blue dot on your phone’s screen hasn’t moved in ten minutes, it can be extremely frustrating. It’s hopelessly bad and on more than one occasion I wanted to throw the phone out the window. The Zenfone 5 has an 8 megapixel camera with LED flash and 1080p video recording. On the front is a 2 megapixel camera with 720p video recording. In terms of image quality, the rear camera produced average looking images. The images look detailed at first glance but then you realize the sharpness is turned up a lot. There is also some amount of noise in the images and the dynamic range is rather poor. The videos weren’t particularly great, either. The front camera had by far the narrowest field of view I’ve seen on a front camera. It just about covers your face at arm’s length and you can forget about having more than one person in the field, at least in portrait mode. Image quality was decent, though. There was something majorly wrong with the LED flash on the back. It worked perfectly fine when used as a flashlight but when it was used as a flash it would let out a dim light resulting in almost completely dark and unusable photos. This is probably just a glitch in the latest firmware and hopefully gets sorted later because it renders the flash totally useless. As with the rest of the phone, the camera application is very nice. It has a clean, simple layout and has all the basic features, along with some scene modes and color filters. The scene modes can be manual selected but depending upon the conditions the camera will also suggest switching to one of the modes, such as night mode in low light or HDR in brightly lit situations. The HDR mode works well and compensates for the poor dynamic range of the sensor although the images don’t look particularly natural then. The Zenfone 5 has a 2110mAh battery, which is not particularly large for a dual-SIM phone. I got roughly 8 hours of usage out of the phone with two SIMs, with over 3 hours of display time. It’s not particularly great but should be enough to get through the day. Also, this is without using any of the power saving modes the phone comes with, that should increase the battery life even more. Overall, ASUS the Zenfone 5 is a fine handset and I enjoyed my time using it. The design is nice, the display looks good and the performance is pretty good, too. Even the UI, which is usually a sore spot with most Android OEMs is great. There are some minor issues, such as the large bezels, no backlight for navigation buttons, the low storage space, and the godawful GPS, and although the camera and battery life are not terrible they could have been better. Still, it’s a good phone and for the expected price of around $200 it’s great value. Hopefully, they’ll fix whatever is wrong with the GPS.